"A delicious, creamy textured soup without the cream. The secret is in the beans! 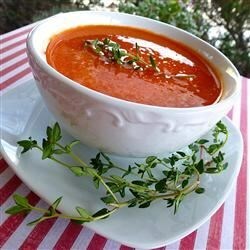 This soup is an all time favorite in my family. Serve hot or cold with a dollop of sour cream, or goat cheese. Sprinkle with some chopped watercress." Excellent taste. I recommend adding chicken breast chunks. Roasting the peppers is the hardest part. I think there are more like 6 servings instead of 3.